PAUL JAY, SENIOR EDITOR, TRNN: Welcome to The Real News Network. I’m Paul Jay. Joining me again is Ronald Charles. He studies religion at the Department of religion at the University of Toronto. Thanks for joining me. RONALD CHARLES, DEPT. OF RELIGION, UNIV. OF TORONTO: Thank you. JAY: So we’ve been talking about Haiti and your family, and the sort of politics of Haiti, to some extent. If you look ahead, if you were going to judge whether there’s a set of policies or institutions coming into being that look positive for the Haitian people’s interest, what would it look like? What would those policies look like? CHARLES: I think of two or three things. One, education. The education needs to be done. It’s to start with Haitian Creole. And this is a big thing, because the French system that we had, as I told you at the beginning, was for the elite. We have a population—we all speak Creole, so we should start with what we have. JAY: And, in fact, it’s interesting. One of the things you did or are still working on is translating the Bible into Creole. JAY: And it’s kind of amazing that it hasn’t already been done 15 times. CHARLES: Well, it’s been done, but what I did, I was doing a revision of the Pentateuch, the first five books of the Bible. So this needs to be done. And really invest in education of the children and of the universities, and education that is applicable to Haiti. That’s one. The second thing, I remember in the ’80s we used to eat Haitian rice. We need to have chicken, our own good chicken. And then what happened? Well, the Miami rice came, and then all the chicken from the outside. Well, they don’t taste the same, according to me. But at the end of the ’90s, we could no longer produce rice, and the chicken we were eating were mostly from outside. So we really need to invest in agriculture. And three, need to invest in reforestation of the country. Haiti, even before the earthquake, was a disaster, an ecological disaster. People, they used to cut trees to make charcoal. But, again, it’s not because they are stupid, but what else could they have done? So there should have a plan so that the people knows what to do, alternative ways of doing things, of having energy, so that they could plant and rebuild the environment of the country. And also the justice system. So everything needs to be put in place. A new generation, a new way of thinking. JAY: Now, I think it’s important for people that haven’t followed what’s going on in Haiti is that it’s a very politicized people. These are people that get engaged in what happens. There’s many political parties. It’s a very vigorous—sometimes violent, but a very vigorous political environment. So how is this to be expressed now, do you think, post-earthquake? CHARLES: Well, I think this needs to continue, and we need to let the people continue to express themselves, because what I find interesting is many times the people want something, but the outsiders, they want another thing for the people. And Haitians, they know what they want. So we’ll need to let the people have their own voices, and say, "What do you want? We want to give you the shoes, but maybe that’s not what you want." Let the Haitians decide for themselves. JAY: I mean, now that the UN mission led by Brazil, the aid mission mostly dominated by the US, has kind of taken over the country, it’s going to kind of be in their hands where political power ends up. Does it go back to the six families that we talked about in the earlier segment? Or is there any institution that’s created that’s actually democratic? I suppose the people are going to have something to say about this. CHARLES: Well, they will have something to say, and I’m really hoping that the big powers and the government will let the people express their own concerns, because it is one thing to have your big thing in mind, but it’s another thing when the people on the ground are asking. And as you said earlier, Haitians, they are really, really politically engaged, from the beginning until now, and they want to continue to express themselves and say there are projects that are ours, but there are others that we do not want, we do not need. I’ve heard about sweatshops. I’ve heard about transforming Haiti into a tourist area. 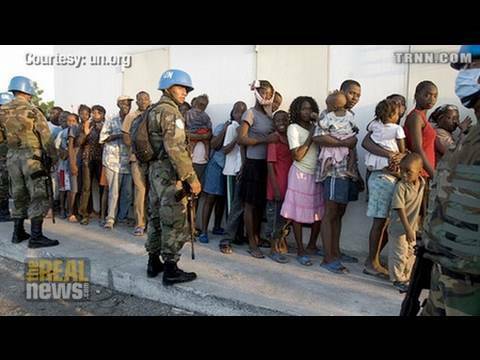 Is that what the Haitians want or need? I would not think so, or I would question that. Sweatshops? Haitians, they need work. They can work. Haitians are not lazy. But they want to be able to have certain dignity. They don’t want the country to become just another resort, another destination for tourists to come to enjoy themselves, when the population itself does not have any say, when the population itself is still under the boots of the elite and of the foreign powers. JAY: So your message to all these millions of donors is don’t just give money; learn about what’s going on in Haiti, and you can advocate for policies. CHARLES: Exactly. Exactly. Be very careful, be very strategic, and demand accountability from the government, from the NGOs, so that we can actually see the people coming from where they are now, after the earthquake, to a better Haiti. Ronald Charles is a Ph.D. student in Biblical Studies at the Department of Relgion, University of Toronto. He is a poet and a violinist. And he was lecturer at Christianville University College in Haiti, where he translated parts of the Bible into Haitian Creole.